idlewood; or, crazy for cowlneck, day 1. 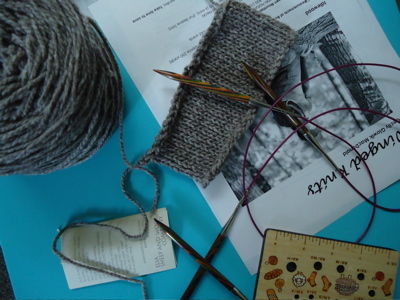 I’d initially intended for my next post to be about blocking the hemlock ring. But that will have to wait until tomorrow. Why, you ask? Because last night I fell hard. For a sweater. Have you seen this absolutely swoonworthy new design by Cecily Glowik MacDonald? I am in love. I immediately started looking through my stash for appropriate yarns and yardages. Beaverslide? Nope, not tweedy enough. Peace Fleece? Not drapey enough. 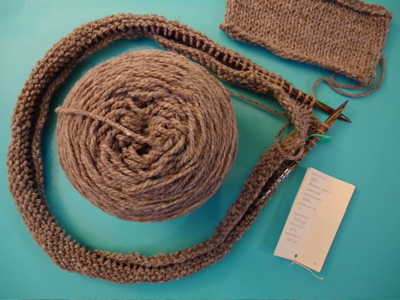 And then I remembered this deliciously soft natural grey cormo from the Elsa Wool Company in Colorado. I purchased six squishy skeins in the fall of 2007 at the Taos Wool Festival, and I’ve been saving it for the right project. I think this is it. 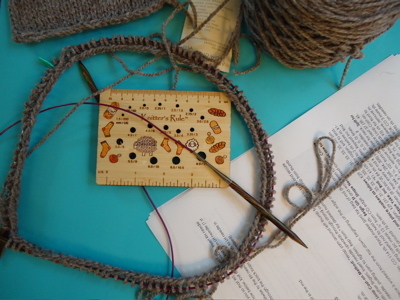 I checked the (handwritten) label, and found that the weight and yardage matched the yarn in the pattern. 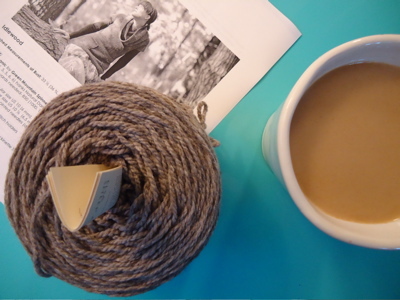 So I swatched as I sipped my morning coffee, and began daydreaming of a cozy grey big-cowled tunic-y sweater. And suddenly the fact that the semester starts tomorrow didn’t seem quite so bad. I mean, this is the perfect sweater to be a hip-yet-studious grad student. Right? This sweater will actually help me with my preparation for my comprehensive exams. Right? My swatch was close enough to the called for gauge, so I washed it, set it out to dry, and then cast on for the cowl neck. This pattern calls for using larger needles than you’d think would be appropriate for the yarn, and because of this, the drape is fabulous. 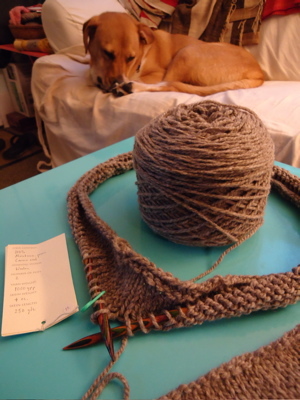 So here I am, twenty-four hours after I first laid eyes on Idlewood: an inch or so into the cowl neck, and a tiny bit more relaxed about the craziness that begins tomorrow.